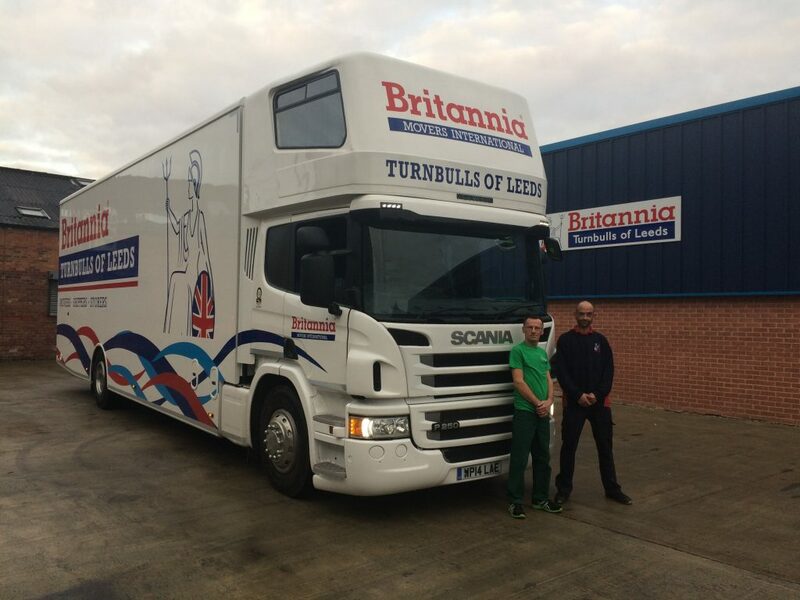 To celebrate 150 years of removals in Leeds, Britannia Turnbull’s have invested over £100,000 in a new vehicle. The new Scania removals van is a world away from the horse and cart vehicles used by the removal company back when it was founded as Turnbull’s Removals in 1867. The new van, pictured below with long serving member of staff Martin Gardiner in the original Turnbull’s green uniform and Gary Collins in the blue Britannia Turnbull’s uniform, is the latest in over 200 trucks which has been owned by the company. As Turnbull’s celebrates its 150th birthday this year, it is believed that the removal company has moved over five hundred thousand households in Leeds, the UK and internationally which is estimated at well over twenty millions boxes and tea-chests full of items moved. It is also estimated that the company has travelled over thirteen million miles on behalf of their customers while moving belongings. A highlight of Turnbull’s history was when the company famously moved Sir Edmund Hillary’s kit to the Himalayas for his first expedition to the summit of Mt Everest in 1953. The removal company is also proud to have maintained its membership of the British Association of Removers (BAR). Fay Chapman, who can call upon 27 years of service to Turnbull’s as Office Manager, said “In 150 years of history Turnbulls has got through quite a few removal lorries – but it’s still always exciting to get the latest, most up-to-date models. It’s hard to believe the combustion engine hadn’t even been invented when the company first launched – the job must have been considerably harder with a horse and cart! Here’s to another 150 years!